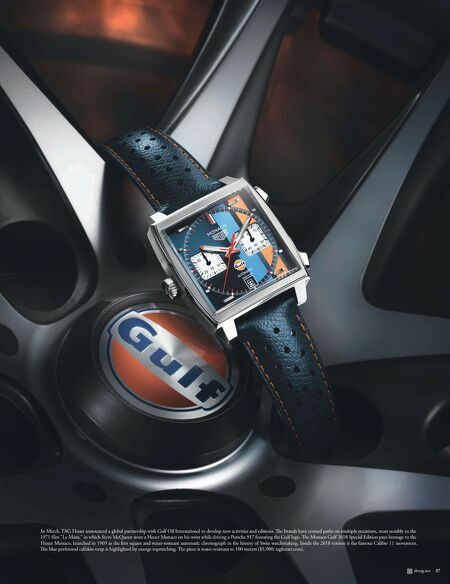 slmag.net 57 In March, TAG Heuer announced a global partnership with Gulf Oil International to develop new activities and editions. e brands have crossed paths on multiple occasions, most notably in the 1971 film "Le Mans," in which Steve McQueen wore a Heuer Monaco on his wrist while driving a Porsche 917 featuring the Gulf logo. e Monaco Gulf 2018 Special Edition pays homage to the Heuer Monaco, launched in 1969 as the first square and water-resistant automatic chronograph in the history of Swiss watchmaking. 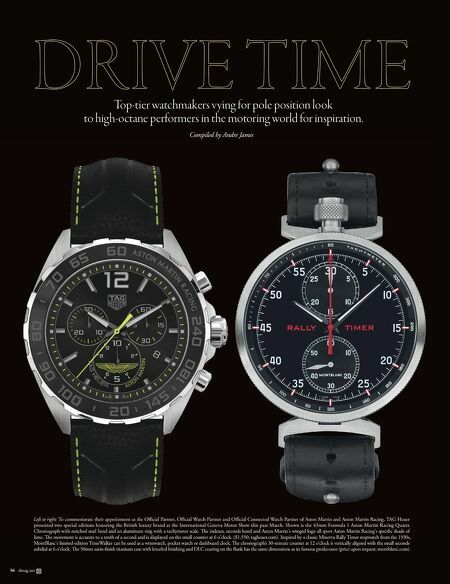 Inside the 2018 version is the famous Calibre 11 movement. e blue perforated calfskin strap is highlighted by orange topstitching. e piece is water-resistant to 100 meters ($5,900; tagheuer.com).